Do you have a Question About our Fireworks Store in PA? Do you sell all kinds of fireworks? Are fireworks legal in PA? Here at Intergalactic Fireworks you must be 18 years old to purchase. Do you offer Buy one Get one Free or the new Buy one Get Two Free? No, at Intergalactic Fireworks we don't double or triple the price of our items. At Intergalactic Fireworks you receive only honest prices (i.e. the excaliber 24 shell kit is $74.99 at Intergalactic Fireworks, a 24 shell kit at our competitors will cost you $180.00 buy one get one free). Nothing is free in life, we just guarantee quality performance items priced correctly or below our competition. I want to buy fireworks, but I am not too familiar with them. Can you help me? 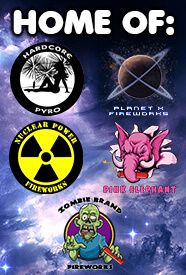 Yes, at Intergalactic Fireworks our staff is professionally trained in pyrotechnics. We can help you design a show with any budget as well as teach you the skills to shoot your fireworks safely for you and your audience. How do I know what a particular item does? All of our products are tested by our staff. In addition we will be glad to show you a video of the item at time of purchase. Yes, most states allow items to be sold (please note each state has it's own set of guidelines for the sale of consumer Class C 1.4G products). Please check our online shipping policy. Do you offer any in store coupons? Yes, click here to see a list of all our store coupons. Do you do firework shows? Yes, our other division High Energy Pyrotechnics is geared to handle any firework display including family barbecues, corporate events, weddings, birthday parties and any other special occasion. Do you sell M-80’s or Quarter Sticks? No, M-80's and Quarter Sticks are not fireworks. They are classified as illegal explosive devices. It has been a federal felony, to possess, manufacture or use these types of devices since the child protection act of 1966. What is the best time to buy fireworks, to avoid crowds? April, May and the beginning of June are the best times. We can give you individual attention and help you choose the best fireworks for your event. During these months most of our new products arrive and are still in stock. What are different classifications of fireworks? Consumer fireworks are also known as class C fireworks or 1.4G fireworks. These products are most commonly sold throughout the United States. Display fireworks are also known as class B fireworks or 1.3G fireworks. These are the fireworks used in large community displays run by licensed professional pyrotechnicians. These products are not allowed to be used by consumers. Yes, at Intergalactic Fireworks we accept all major credit cards including American Express. To better serve your needs, Intergalactic Fireworks is open year-round. Check our web-site for time changes throughout the year. If not, please complete this form below and we will get right back to you.